Whether or not you’re familiar with the workshops Vapa offered at Roof68 during 2009-2010-2011 you might be surprised to hear that we will be upgrading most workshops contents to meet your criterias. New experts are joining this knowledge journey that we hope will continue to enlighten your paths and the paths of many people that do not have the means to participate with us and reinforce their skills. Therefore this year starting automn 2011 we will establish a new policy that will be applied to all participants. Read more about it in the Community Learning Program page. As for the curriculum here’s a glance about the upcoming workshops,the trainers” bios and the space where they will take place will be announced soon. http://www.roof68.com has transformed into a different concept, the place doesn’t exist anymore, Vapa is located in the same building but in the ground floor while workshops will be catered depending on their logistical requirements. I – Introduction:-Different genres in Creative Writing-Goals and objectives-II – Creative Writing exercises:-Description -Dialogue Listening-Creating characters-Character mapping-Lateral thinking-III – Creative Writing games:Childhood memories-What if?-Five senses-Using paintings to make up stories-Storytelling games-Writing Prompts-IV – Creative Writing tips- V – Final project. With a background in Advertising, Marketing, HR, Hospitality Management, Tourism and the Communication Arts from NDU, Charbel Naim is currently VAPA’s communication officer and a member of Improbeirut acting group. He is also a news editor/writer, actor and trainer. Designed for individuals working in any freelance field. Through this course you will be learn basic accounting skills in order to organize finances and set up monetary plans for your future business. How to correctly assess your financial plan and understand the terms used in the accounting field and understand government based restriction such as tax and documentation needed. She has been working as an accounting consultant and trainer since she graduated with an MBA in finance in 2002. Most recently, she started as a freelance accountant-operating small to medium businesses, made her portfolio of clients and acquired an office to conduct her professional consultancy. How to establish a business?, Type of businesses, Agreement contract, Why do we need supporting documents for every transaction in the business?, Email correspondence, Invoicing, How to avoid bad debts?, How to charge clients for services (if applicable)?, Time value?, How to arrange a business stock (if applicable)? MOF registration and number, MOF number labeled on all documentation and forms, Maintain legal papers of the business and update them yearly, Legal papers authentication and registration in necessary parties, Deadline for taxes submission, Tax on salary, Income tax, Vat, NSSF, Are consultants needed for every type of business (lawyer, auditor, and accountant)? Finger-painting isn’t just for children, this workshop is intended for people of ages 15 and over. Its aim is to facilitate the ability of self-expression through the interesting connection between the physical act of touching the paint and connecting with something important inside one’s self. Like yoga, finger-painting is a physical and spiritual opening up that helps you transcend and reach a different place within yourself, …allowing you to explore body, mind and soul. It’s a good activity to fully express yourself! You probably have childhood memories of sitting at a little table, dipping your fingers into thick, brightly colored paint and noodling your way around a sheet of smooth, shiny paper. These paintings were usually formless squiggles, blobs and lines created from a child’s carefree lack of inhibition. But finger painting isn’t just for children! Finger painting was a long-forgotten art form used by ancient peoples in North America, China and Europe. This activity has a spiritual component; like yoga, finger-painting is a physical and spiritual opening up that helps you transcend and reach a different place within yourself, allowing you to explore body, mind and soul. Known for a painting peace marathon entitled 72 Hrs, Kiki is an artist adapting her skills to the different influences Lebanon’s society goes through in a constant effort to improve the conditions of discriminated communities. Kiki is born in Paris during April 1975 but grew up in Lebanon during the civil war. In art she found a refuge and at a very early age, when she first started implementing her inspirations. Would you like to tell if someone is lying? Are you looking for a way to improve your communication skills? Are you seeking more cooperation and understanding from other people? This workshop will sensitise you to your own non-verbal signals and will help you read key signs from the people you are dealing with, which will help you reach better deals, make a positive impression, choose well your partners and friends and even boost your self-confidence. All this in a fun and interactive atmosphere using improvisations, videos, photos, and role-playing games. This workshop will be given by VAPA’s Communication Officer, Charbel Naim, who besides his background in Advertising, Marketing, HR, Hospitality Management, Tourism and the Performing Arts, has a rich experience in improvised theatre and is a member of Improbeirut acting group. He is also a news editor/writer, actor and trainer. Fee $200 / Registration is a must! The Photo Workshop is an educational resource for photography. From beginning classes, for those just starting out in digital photography or photography, to advanced classes covering lighting techniques, to your own personal photographic vision, we have classes that cover a broad spectrum. Classes are held at Vapa Association/Ground68 studio space, 68 St Louis Street, Al Sami (Pepite) Bldg, located just a short walk from MTV Offices bldg or Spinneys Supermarket in Fassouh, Ashrafieh-Beirut (address found in our contact info page). Come and learn that next step in your photography journey. Classes are casual and fun and cover both technical & creative aspects of everything photographic. Starting 28, 29, 30, 1st of June. 6-9pm. The Fee is 160$ for the full course/ 4 sessions. This workshop is organized for professionals and semi professionals working in the fields of art-direction, creative industries & agencies, graphic design, illustration and graffiti art. The goal of the workshop is to create richer knowledge and more awareness about typography and it’s possibilities in art and advertising and thus creating better work for the artist and client. We will be experimenting with and creating through multiple examples of how typography can be used. Also learning where typography came from you’ll get to know letters and how they can work for you through artistic expression. Understanding letters is a very big part before we start experimenting and in the end we will make a mural so that our gathered knowledge shall be spread to the rest off the world. Niels Bakkerus is a young artist and illustrator working and living in Eindhoven, The Netherlands. Niels studied graphic design and communication at St. Lucas and illustration at AKV St. Joost. Through graffiti Niels got into typography and created his own style of illustration and typography. This style that combines illustration and typography is typical for the works of Niels. To him those two are the same. Because of his background in graffiti he was well known with lettering itself but got into custom lettering more and more and started to master the art of penmanship and calligraphy as well. His most advanced works where all of these influences are combined are his complex ambigrams. Lettering designs that can be read normally and upside down as well. Niels works in the fields of illustration and graphic design, but also works an artist on his own personal projects. His vision on how to combine those two will be of big influence in the workshop. The workshop will be divided into two sections, theory and practice. The first 4 days are intended to get inspiration and knowledge. Each theory day there will be room for practice as well. The last 4 days will be about creating a mural in Lebanon with the entire workshop team. Day 1. Introduction of Niels Bakkerus. Niels will introduce himself and will show his portfolio. His personal portfolio and his commercial one, and tells about how to incorporate those two different things into projects. He will also explain his way of working. Day 2. Lecture in the history of typography. Plus small commission to experience the theory in practice. Things that will be thought are things like Penmanship, gothic letters, spencerian script, roman script, custom lettering, digital lettering etc. Day 3. Dutch Typography. The Netherlands have always been well known for it’s progressive and ground breaking designs. Niels will give a lecture about Dutch design and Dutch typographic design. Artist like Niels Meulman, Job Wouters, Jan van Krimpen, Zeds, Bureau Mijksenaar will be handled. Plus small commission to experience the theory in practice. Day 4. Typo in Art & Advertising. Lecture about artworks based on typography and ground breaking advertisements. Day 5. Creating and experimenting with the design for the mural. Day 6. Finalize the design for the collaboration mural, creating composition. Day 7. Start with the painting of the Mural. Day 8. Finalizing the Mural and the course itself. The course will be an intensive 10-day workshop. 4 days of theory, a 2 day break, and a finalization of 4 days practice and production. Each session will be 3 hours long, from 6 pm to 9 pm. 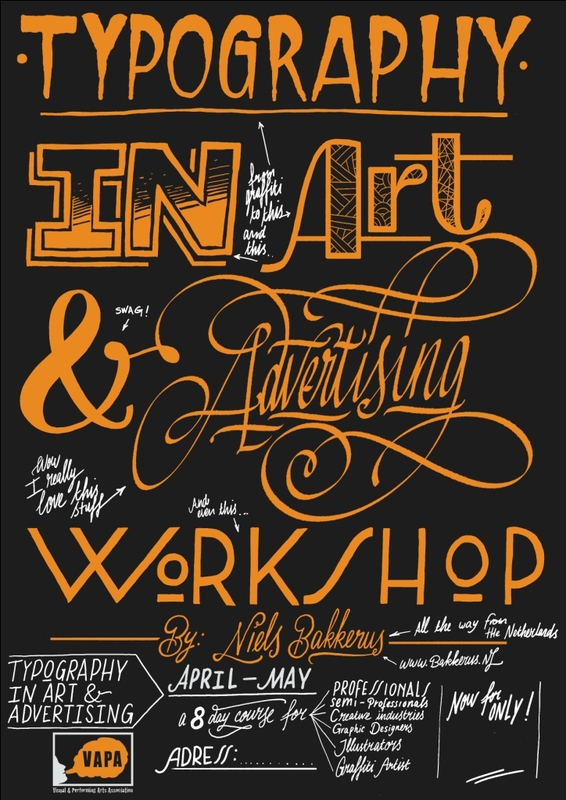 Typography workshop dates are May 23, 24, 25, 28, 29, 30. Registration asap is a must! This workshop is designed to help educate kids and preteens on the rewards and risks in blogging/social networking culture. We will be learning how social medias have changed the definition of identity and personal information. How we can use these mediums to express our creativity in a positive manner. As well as have fun creating our own blogs based on personal interests and learning how to maintain our work. For each age category they will be divided into separate groups. For example 8-11, 11-14. -Basics structure of blogs. How they work and understanding the terms. -What we can do through this medium. Showing examples of different blogging technique. -Learning which blog sites are best for your interest. -Risks of publishing personal information. Techniques and material to avoid posting. -Blog maintenance, how one updates their material. -Begin working on personal blogs, each student presents which direction they would like to take with their blogs. -Final presentation by students, what they have come up with and direction they would like to take in the future. -Who to follow in order to keep up with their interests and contribute to the network. Nate is an American writer and photographer currently volunteering in Beirut, taking time off from his work and schooling back in Hong Kong. Spent two years studying at a university in the communication field focusing on writing/journalism. Interested in social media and how it can be developed to progress human creativity and positive development. $100 for all three sessions. Venue: will specify once registered. This teen course is an introduction to the professional field of graphic design. iDesign: A graphic design workshop for teen will provide insight into digital imagery and illustration. Teens will be able to create pictures, flyers, covers and other designs, using the professional programs Adobe Photoshop, Illustrator and InDesign. The course curriculum is custom made to meet every participant’s need. Christine joined the Lebanese Univeristy of Beaux Arts in 2004 and has a major in graphic design. “Graphic design helped me learn how to produce digital work. Neo-classics and portraits are the theme I paint and fancy mostly. As for the digital art I produce, I make sure that retro personalities come alive in most compositions, and through effects”. She Participated in many art exhibitions along with other artists and did her own exhibition in Saifi last year. Workshops are held by both Local and International artists. Workshop Course, Day & Time (we remain flexible for any change in the days or hours regarding most workshops). For all the updates join our Facebook Group: Vapa Association. To have a brief glance at some of the courses please follow us. Burk is a German artist and illustrator who lives and works in Berlin, Barcelona and Beirut. He studied Communication Design at the University of Arts in Berlin http://www.gwk.udk-berlin.de/en/ and worked 2 years at animation studio, where they made feature films. He is a freelance illustrator since 1998 for magazines, advertising agencies, public relation, marketing, books, websites, presentations, posters postcards, calendars etc. His clients include: German Prime Minister, European Union, Volkswagen, Mercedes Benz, Absolut Vodka, Coca Cola. you have accrued right here, definitely like what you’re thinking and the way through which you say it. You’ve taken the effort to make it simultaneously entertaining and intelligent. I can not wait to know much more from you. A beneficial blog without a doubt. Hi, I’m a writer based out of Potsdam, Germany and I found your site via https://vapablog.wordpress.com/workshops/. Would you have any ideas for those considering blogging? I’m working on starting my own website soon but I don’t really know where to start. Would you suggest starting out with a free platform like WordPress or go for a paid option? There are so many possibilities out there that I’m completely overwhelmed.